Online dating is a lonely experience, but in fact you're not alone! Share your story or questions and after we receive your story, we'll publish it on our site and you will be able to discuss your experience with other online dating members, get advice, give advice and learn. Knowledge is power! Or ask a question. You can be totally anonymous, only your email address is required to verify there's a real you. 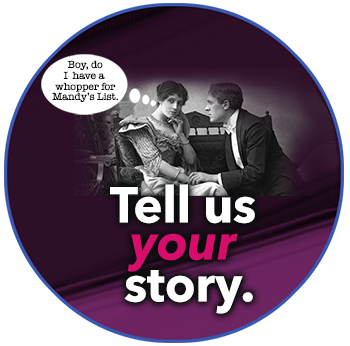 Please note: by submitting your story or question you are giving Mandy's List permission to act as your editor to create the title, graphics and format of the URL page in our website where it will appear. We also will make any spelling corrections before publishing. Other than that we do not alter or edit your statements or make any other changes. If we feel different language or other changes could be useful to state your story, we will contact you first by email. Tell us your online dating story by email or below!